Each drop of E-Gem Oil contains 10 IU of Vitamin E (d-alpha tocopheryl acetate) derived from vegetable oil (5,000 IU of Vitamin E per 1/2 ounce). Apply externally to aid and soften skin or may be taken orally when controlled dosages are desired. Solar D Gems provides the natural form of vitamin D3 for people who do not get enough from the sun. This is the only form our bodies make when our skin is exposed to the sun's rays. Vitamin D is important for bone health and immune system function. Provides 115 mg of Omega-3s. Niacin is an essential B-Vitamin (B-3). Niacin is involved in the normal metabolism of fats and fat-like substances such as cholesterol. Niacin taken in a single 500 mg dose often causes flushing or itching. Carlson Niacin-Time is prepared to minimize or eliminate these unpleasant side effects by providing a gradual release of Niacin over a period of several hours. From the deep, unpolluted waters near Norway, Carlson brings you the finest cod liver oil which is naturally rich in Vitamin A, Vitamin D3, EPA and DHA. Only cod fish caught during the winter and early spring are used, as the liver oil content is highest at this time of year. The oil is separated from the liver tissues without the use of chemicals. To ensure freshness of Carlson Norwegian Cod Liver Oil, the air inside the glass bottle has been replaced with nitrogen. Natural vitamin E is added to the cod liver oil to protect the freshness of the EPA and DHA both within the bottle and our bodies. Vitamin E prevents oxidation of polyunsaturated oils. Each soft gel provides 400 mg of Magnesium from Magnesium Oxide. Magnesium is involved in normal energy production, muscle contractions, and strong bones. Magnesium aids Calcium utilization. Mini-Multi takes the confusion out of taking many supplements. One tablet a day of this multiple vitamin and mineral formula provides balanced amounts of important natural nutrients. Mini-Multi is a small easy to swallow tablet without iron. Solar D Gems provides the natural form of vitamin D3 for people who do not get enough from the sun. This is the only form our bodies make when our skin is exposed to the sun's rays. Vitamin D is important for bone health and immune system function. Provides 115 mg of Omega-3s. Carlson Digestive Aid #34 is a natural food enzyme formulation prepared to supplement body secretions to aid in the utilization of food. It is prepared with pancreatic enzymes, pepsin and bile. Pancreatic enzymes (protease, amylase and lipase) are the body's most powerful food enzymes, having the ability to break down protein, starch and fat. They are produced by the pancreas and delivered to the small intestine where they are involved in food utilization. Bile is produced in the liver and involved in the utilization of fat. Each tablet provides sufficient enzyme activity, measured under simulated physiological conditions, to digest 34 grams of dietary protein, 120 grams of dietary starch and 21 grams of dietary fat. Niacin is an essential B-Vitamin (B-3). Niacin is involved in the normal metabolism of fats and fat-like substances such as cholesterol. Niacin taken in a single 500 mg dose often causes flushing or itching. Carlson Niacin-Time is prepared to minimize or eliminate these unpleasant side effects by providing a gradual release of Niacin over a period of several hours. The Very Finest Fish Oil comes from deep, cold, ocean-water fish. It is processed and bottled in Norway to ensure maximum freshness. Take by the teaspoonful, mix with foods, try it on salads! It has a refreshing lemon taste. THIS PRODUCT is regularly tested (using AOAC international protocols) for freshness, potency and purity by an independent, FDA-registered laboratory and has been determined to be fresh, fully potent and free of detrimental levels of mercury, cadmium, lead, PCB's and 28 other contaminants. From Norway: The finest fish oil from deep, cold ocean-water fish. Bottled in Norway to ensure maximum freshness. Refreshing natural orange taste. Take by the teaspoonful, mix with foods, and try it on salads! THIS PRODUCT is regularly tested (using AOAC international protocols) for freshness, potency and purity by an independent, FDA-registered laboratory and has been determined to be fresh, fully potent and free of detrimental levels of mercury, cadmium, lead, PCB's and 28 other contaminants. Carlson EcoSmart Omega-3 is an eco-friendly product that is made from highly sustainable species of calamari. Also available in easy to swallow soft gels. This is a certified �Friend of the Sea� product. Each soft gel provides 400 mg of Magnesium from Magnesium Oxide. Magnesium is involved in normal energy production, muscle contractions, and strong bones. Magnesium aids Calcium utilization. From the deep, unpolluted waters near Norway, Carlson brings you the finest cod liver oil which is naturally rich in Vitamin A, Vitamin D3, EPA and DHA. Only cod fish caught during the winter and early spring are used, as the liver oil content is highest at this time of year. The oil is separated from the liver tissues without the use of chemicals. To ensure freshness of Carlson Norwegian Cod Liver Oil, the air inside the glass bottle has been replaced with nitrogen. An innovative formula based on scientific research and clinical experience to promote and maintain healthy heart rhythm. E-GEMS are Carlson's golden gelatin gems containing concentrated natural-source vitamin E oil, d-alpha tocopheryl acetate. The vitamin E is derived from soybean oil. Synthetic vitamin E is never used. From Norway, a highly concentrated, balanced professional strength fish oil. MedOmega supplies 1200 mg DHA and 1200 mg EPA per each delicious natural lemon-lime flavored teaspoonful. THIS PRODUCT is regularly tested (using AOAC international protocols) for freshness, potency and purity by an independent, FDA-registered laboratory and has been determined to be fresh, fully potent and free of detrimental levels of mercury, cadmium, lead, PCB's and 28 other contaminants. Niacin is an essential B-Vitamin (B-3). Niacin is involved in the normal metabolism of fats and fat-like substances such as cholesterol. Niacin taken in a single 500 mg dose often causes flushing or itching. 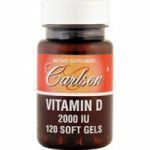 Carlson Niacin-Time is prepared to minimize or eliminate these unpleasant side effects by providing a gradual release of Niacin over a period of several hours. The Very Finest Fish Oil comes from deep, cold, ocean-water fish. It is processed and bottled in Norway to ensure maximum freshness. Take by the teaspoonful, mix with foods, try it on salads! It has a refreshing lemon taste. THIS PRODUCT is regularly tested (using AOAC international protocols) for freshness, potency and purity by an independent, FDA-registered laboratory and has been determined to be fresh, fully potent and free of detrimental levels of mercury, cadmium, lead, PCB's and 28 other contaminants. From Norway: The finest fish oil from deep, cold ocean-water fish. Bottled in Norway to ensure maximum freshness. Refreshing natural orange taste. Take by the teaspoonful, mix with foods, and try it on salads! THIS PRODUCT is regularly tested (using AOAC international protocols) for freshness, potency and purity by an independent, FDA-registered laboratory and has been determined to be fresh, fully potent and free of detrimental levels of mercury, cadmium, lead, PCB's and 28 other contaminants. From the deep, unpolluted waters near Norway, Carlson brings you the finest cod liver oil which is naturally rich in Vitamin A, Vitamin D3, EPA and DHA. Only cod fish caught during the winter and early spring are used, as the liver oil content is highest at this time of year. The oil is separated from the liver tissues without the use of chemicals. To ensure freshness of Carlson Norwegian Cod Liver Oil, the air inside the glass bottle has been replaced with nitrogen. Medical Scientists Internationally are encouraging people to eat more fish. Fish body oil is the major source of the highly polyunsaturated omega-3's EPA and DHA. For those individuals who do not eat an oily fish diet, Carlson offers omega-3's in easy-to-swallow soft gelatin capsules. Carlson Elite Omega-3 Gems contain 1250 mg of a concentrate of fish body oils from deep, cold water fish which are especially rich in the important omega-3's EPA and DHA. THIS PRODUCT is regularly tested (using AOAC international protocols) for freshness, potency and purity by an independent, FDA-registered laboratory and has been determined to be fresh, fully potent and free of detrimental levels of mercury, cadmium, lead, PCB's and 28 other contaminants. E-Gems Elite is an exclusive blend of eight forms of natural source tocopherols and tocotrienols providing the antioxidant benefits of the entire family of vitamin E. Research supports that all natural forms of vitamin E as found in foods have beneficial properties playing roles in protecting body cells from free radical damage.